Water quality samples collected over four dates within two weeks of Florence crashing ashore a few miles away from Duke Energy Corp.’s Sutton power plant found no excessive levels of arsenic, lead, chromium and other metals, the state Department of Environmental Quality said. The state’s test results aligned with the samples Duke Energy collected and tested at an in-house lab. They showed no negative impacts to the river after a dam breached at the company’s Sutton power plant, the company said. The state’s initial test results demonstrate “that Cape Fear River quality is not harmed by Sutton plant operations,” Duke Energy spokeswoman Paige Sheehan said. The Wilmington area received more than 30 inches (75 centimeters) of rain from Florence before the swollen river rose to its crest and remained at flood stage for days. Floodwaters breached several points in the earthen dam at Sutton Lake, the plant’s 1,100-acre (445-hectare) reservoir. Lake water then flooded one of three large coal ash dumps lining the lakeshore. The ash left over when coal is burned to generate electricity contains a range of potentially toxic heavy metals. The plant’s inundated basin contained about 400,000 cubic yards (305,820 cubic meters) of ash, Duke Energy said. A spokesman for Earthjustice, an environmental advocacy group that launched a boat into the river within a week of the breach to collect its own samples, said the reported test results aren’t conclusive. The impact of the flooding at the former coal-burning power plant can’t be known until the river bottom is tested for pollutants that are likely to linger in the sediment, Earthjustice attorney Peter Harrison said. “It would be reckless to claim that there have been no impacts to the lake and river, no ongoing threat, and no release of coal ash, without thoroughly evaluating the sediment,” Harrison said in an email. 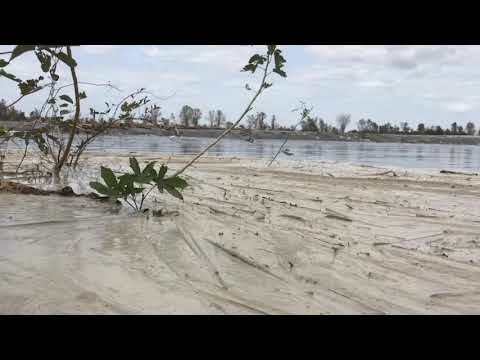 The state environmental agency on Monday reported that sludge washed from buried coal-ash pits at Duke Energy’s H.F. Lee power plant in Goldsboro also hadn’t polluted a neighboring river with heavy metals at levels concerning to human health.